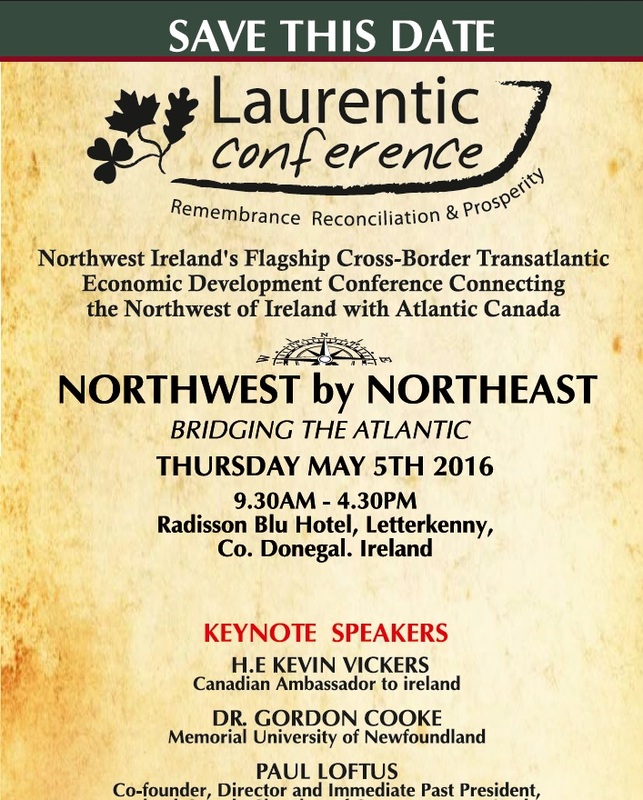 The Laurentic Commemoration is now in its 10th year and the Conference in its 8th year. Five Keynote speakers Kevin Vickers, Dr. Gordon Cooke, Paul Loftus, Seamus Butler and Colm McColgan are combined with local DCC and LYIT college representatives to welcome this year’s event. Kevin Vickers was appointed as the Ambassador of Canada to Ireland in January 2015 and this is his first official visit to Donegal. He previously served as the Sergeant-at-Arms of the House of Commons, and furthermore hailed as a hero by Canada’s parliamentarians, and other prominent Canadian and international figures for his actions in stopping the October 2014 attack at the Parliament of Canada. 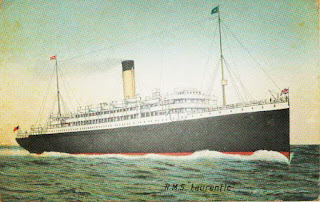 The Conference origins were to commemorate The SS Laurentic that was built in Belfast by Harland and Wolff for the famous White Star Line on the Trans Atlantic Route from Liverpool to Montreal, Canada. During the outbreak of WW1 in 1914 while in Montreal she was commissioned as a troop passenger ship. Her final voyage in 1917 en route to Halifax,Canada from Liverpool was carrying a full shipment of Gold Bullion and it stopped at Buncrana, Co Donegal (then the base for the Grand British Fleet). On the way out of Lough Swilly it was hit by 2 German mines and resulted in the tragic loss of life, 354 men at the time of its sinking. Over the course of the past eight years, the Laurentic Conference has been a key instigator for cross-border change and collaboration along with developing links with Atlantic Canada. Paul Hannigan- President of LYIT will welcome the event and it will be followed by an overview of the past year. A brief introduction to Newfoundland & Labrador & the Northwest as a suitable Cultural & Societal Fit will be followed by a comparison between academic research studies between Donegal and Newfoundland by Dr Gordon Cooke – Associate Professor, Faculty of Business, Memorial University of Newfoundland and Labrador. A representative of Donegal County Council will address the conference in terms of its networking links and the “Cultural Aspects of Doing Business with Canada" this is further explored by Paul Loftus Co-founder, Director and Immediate Past President, Ireland-Canada Chamber of Commerce, Montreal under the umbrella of “Ireland Canada Relations and the Potential of CETA”. Canadian Ambassador to Ireland, Ambassador H.E Kevin Vickers will close the session before lunch in his speech. The afternoon introduces the topic of “Monetising the NW by NE Partnership” Chairperson Michael Mcdonagh for the Department of Foreign Affairs gives a comprehensive overview followed by Seamus Butler(CEO of Butler Manufacturing) on “Exporting- the NL experience” There is an opportunity to engage in the video link session, Randy Gillispie from the Marine Institute, Memorial University of Newfoundland discusses their economic impact in the locality, followed by Allison Dancy, Ireland/UK Trade and Development Officer, The Department of Business, Tourism, Culture and Rural Development the Government of Newfoundland and Labrador concluding with “Economic opportunities’ between Newfoundland and the Northwest”. The 10th annual Laurentic Commemoration is on Friday May 6th with a wreath laying ceremony at Mura's Church Ireland Cemetery Fahan at 10:00 am, St Mary's Cemetery, Cockhill at 11:00 am followed by a reception at Fort Dunree at 12:00 noon after the reception the Canadian visitors will be given a bus tour of Inishowen highlighting some of the Diaspora links with the area; local iconic attractions and scenery that make Inishowen a place to return to year after year as a destination or part of a journey exploring Ireland’s Northwest a truly memorable experience. This is a commemoration to a tragic event; however it is a celebration of how two regions have built strong links across the Atlantic and would like to see the local community attend. There is something to learn both from a business or personal perspective. Contact Info & Registration via email laurentic2014@gmail.com.